Exercise bikes are one of the more diverse types of exercise machine that you can add to a home gym. They come in all different shapes and sizes with different functions. Some are simple machines for beginners that want a gentle approach while others are more intense and sporty. Some use them to maintain fitness levels at home when road cycling is off-limits. Others have bigger goals for weight loss, muscle toning and general health. The following advantages show that there are many benefits to choosing an exercise bike for health and fitness. This is the main reason why many people choose to own an exercise bike at home. There are some models that are simple a leisurely and others that are much more intensive, such as spinning bikes. The most basic of stationary bikes can help users burn calories over a thirty minute session. It is said that if you work at a moderate pace for 30 minutes you can expect to burn about 260 calories. This does depend on pace, weight, resistance and length of session. It is all about building up those leg muscles, increasing tone and improving overall fitness and stamina. Stationary bikes are ideal for working those calves and quads because all the energy and movement comes from the pedalling. This can be customised depending on the rider and machine. Recumbent bikes offer a much more gentle pace and comfort while spinners let riders stand up and push the muscles further. This pedalling motion, whichever style you use, is ideal for keeping our joints mobile and healthy. The motion works the hips, knees and ankles in a repetitive motion without causing too much strain. This gradually opens them up to provide greater flexibility and range of motion. There are many exercise bikes that offer a gentle action with minimal impact. This means that they are perfect for larger users that are not used to exercise and want a low impact option. Riding an exercise bike at home each day is about much more than burning a few calories and toning up your legs. The aerobic exercise has also been proven to help people reduce their cholesterol. This is great news for anyone of a certain age that is struggling with this issue and wants an easy fitness option. This exercise can lower bad cholesterol to the point where 30 minutes every weekday could actually extend your life. This impact on cholesterol is just part of the many benefits related to heart health and cardiovascular function. A regular session on an exercise bike has the potential to strengthen the heart, ensuring that it circulates blood and oxygen more easily. It can also help with lung capacity and general circulation issue. This can have a massive effect on day-to-day fitness and life expectancy. Exercise is a great tool for dealing with mental health issues such as anxiety and depression. It takes us away from the world and gives us a goal with an achievable aim. Riders can pound out frustrations on a long computerised course while listening to music through MP3 systems. This action also releases endorphins to physically make users feel better. It can be difficult for many first time exercisers to create a routine that they stick to. Exercise bikes offer a great way around this because they provide such a simple form of exercise with traceable goals. You can set times and distances, with the more advanced bikes offering interesting training options. Most bikes will also provide a way of tracking data so you can measure your progress without a personal trainer. 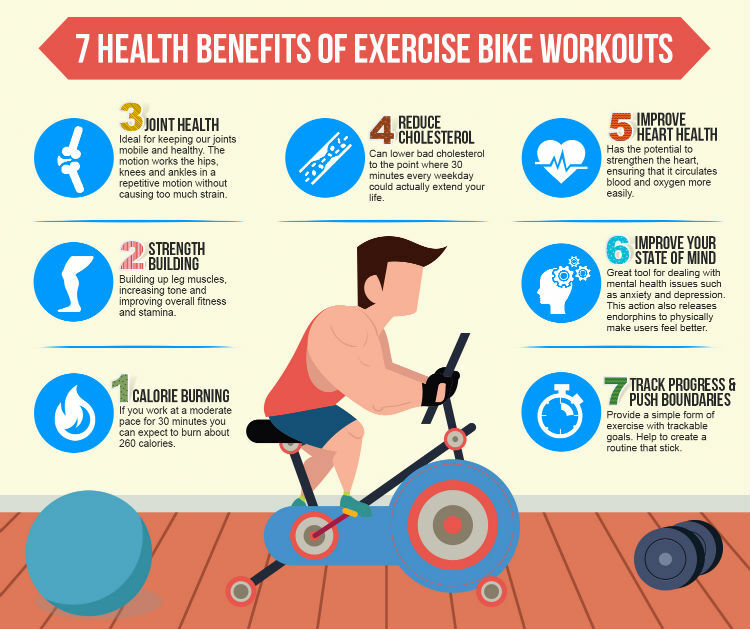 These 7 health benefits of exercise bike workout show that there is more to these machines than initially meets the eye. Some users may buy them thinking that they will get a little fitter if they cycle a little each day. The truth is that these daily sessions can actually have a big impact on heart health, bone health, mental health and longevity – not just the strength of your calves.